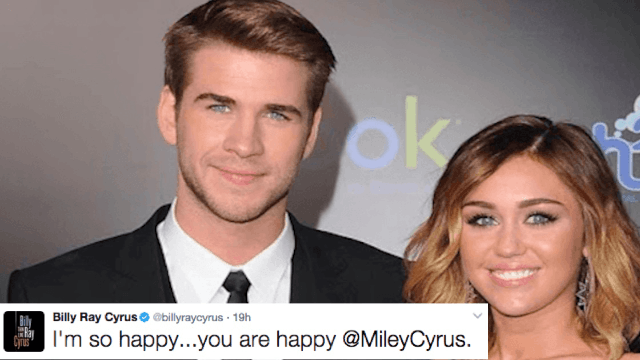 Billy Ray Cyrus sure seems to be suggesting that Miley and Liam secretly got married. Proud dad Billy Ray Cyrus shared a happy photo of a white dress-clad Miley Cyrus, whom we all know is engaged to Liam Hemsworth, so OH MY GOD. To Twitter, vague message of happiness, combined with the white dress, reeks of wedding bells. 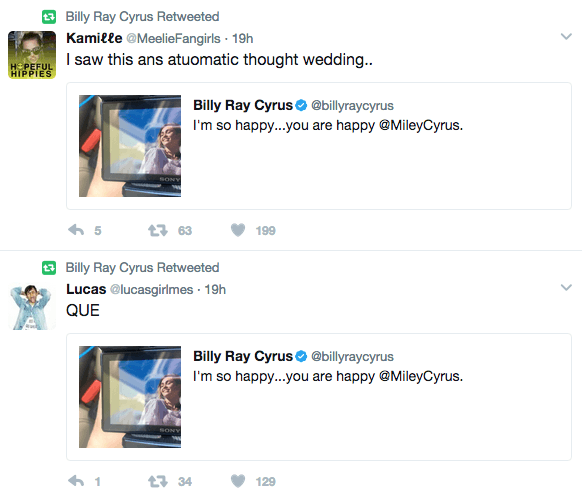 Papa Cyrus spurred suspicion to the the next level by retweeting suspicious people ready to celebrate the nuptials. B-but, why is the picture through a monitor? Which appears to be in a van? But also, why would the Father of the Bride fan rumors he knew not to be true? If there really was a wedding, there's no doubt that it probably featured flower crowns, the hunky Hemsworth extended family, and certainly a weed tent.